Journey through dense rainforest, thundering waterfalls and dramatic gorges aboard one of Queensland’s most scenic railways as it winds its way through the mountain ranges between Cairns and Kuranda. Admire the spectacular views as you journey through the canopy to the remote village in the rainforest, Kuranda, where you can spend time exploring markets, cafes and galleries. 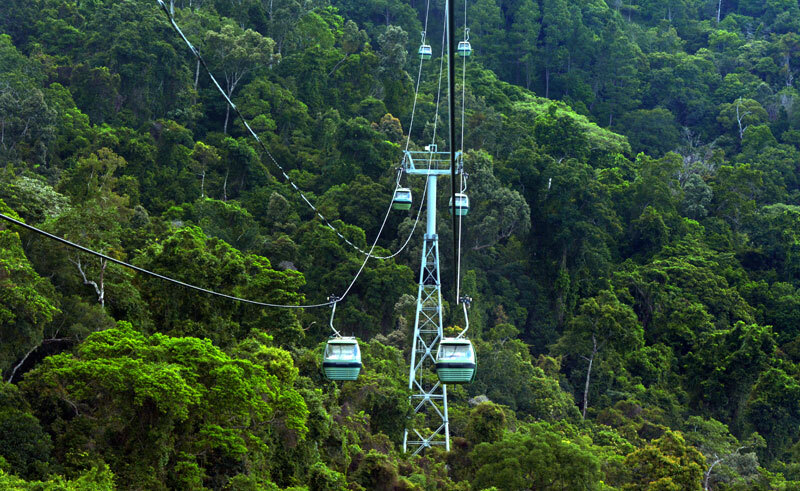 After a spot of lunch, you will return by boarding the breathtaking Skyrail. Glide just metres above the treetops in your private gondola, descending through canopy layers and deep into the heart of the forest. Disembark at the two rainforest stations and enjoy a guided ranger walk and visit to the Rainforest Interpretation Centre to explore the wonders of this ancient tropical rainforest and learn about one of the most botanically fascinating and diverse areas on earth.